Dragonlore, the bestselling fantasy series beginning with A Dawn of Dragonfire, concludes with a tale of blood, steel, and flame. Requiem burns. Her marble columns lie shattered. Queen Solina's army sweeps across the land, searching to kill every last dragon. Among the ruins, Requiem's dragons plan a desperate attack. To survive, they must strike Solina at the heart of her desert empire. Yet as Requiem rallies, Solina raises her cruelest champions yet. The nephilim, the spawn of demons and their mortal brides, have languished underground for epochs. Giants of rotted flesh, razor fangs, and clawed wings, they crave to crush the world that imprisoned them. When Queen Solina frees this unholy legion, the nephilim marshal under her banners… and swarm into Requiem. Requiem's light dims. Her hope is but a flicker in an endless night. 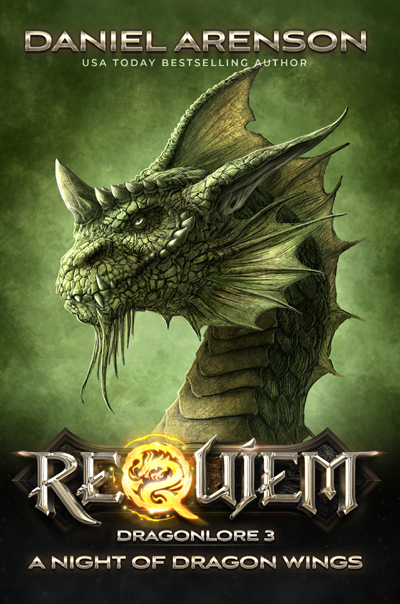 As ancient evil engulfs the world, Requiem's dragons roar, blow their fire, and fly to their last stand.